A Connecticut Private Estate Wedding is a dream to photograph. Connecticut is a wonderful state, with an abundance of picturesque locations for a fabulous wedding event. A Connecticut Private Estate Wedding is one that truly shows off the personalities and styles of the bride and groom through the details that make up the ceremony and reception. 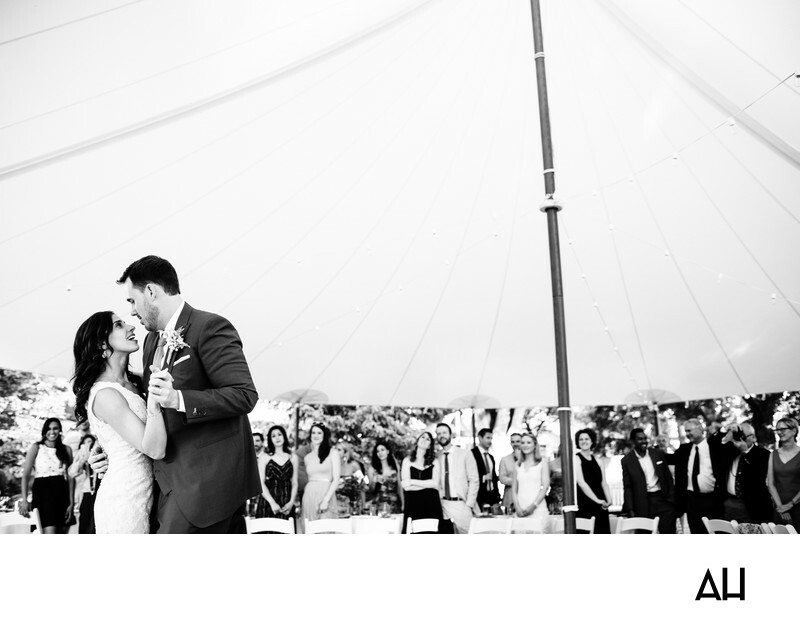 This image shows a black and white photo of the bride and groom sharing their first dance beneath the reception tent. The tent is raised up high, but left open on the sides which allows guests to enjoy the beautiful Connecticut scenery that surrounds them. At this point in the wedding day, guests have gathered around the dance floor to watch the bride and groom sway to the music of their song. The guests stand quietly, observing the magic of the scene before them with affection shining out of their eyes. The groom wears a classic dark suit, and the bride and vintage styled white gown. Together they make a timeless picture of love and devotion. The black and white of the photo draws attention to the newlyweds, especially with the expansive canopy of the tent as a backdrop. The groom holds his new wife close, singing along with the lyrics of the song that fills the space of the tent and flows out into area around it. Anyone witnessing this moment can tell that the relationship shared by the bride and groom is one rooted in friendship and old-fashioned romance. Theirs is a marriage that was truly meant to be.